I use a few garbage bins in my workshop which I empty into garbage bags for disposal. As one of my plastic bins was getting very dirty from old paint rags and glue remains, and my metal bin began to rust, I decided that it was time for something else. 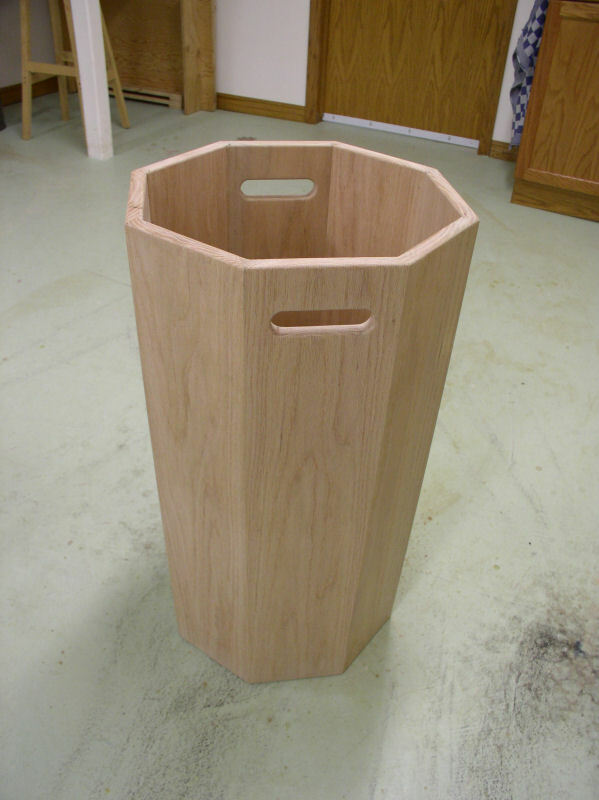 An eight-side oak garbage bin, tapered slightly smaller at the bottom, to fit a standard 26" wide by 36" high garbage bag was called for. My real excuse? To be able to use my new Bosch router and I have never used a bird's mouth router bit. The time reflects 9¾ hours of building time and 3¾ hours of finishing time. I used this project to learn making drawings with DesignCAD 3D Max 16, but that time is obviously not included. With respect to cost, the 1" x 8" red oak is Can$5.54 per linear foot plus 6% GST. For sure there are cheaper solutions. These drawings are based on using a 26" wide by 36" high garbage bag. 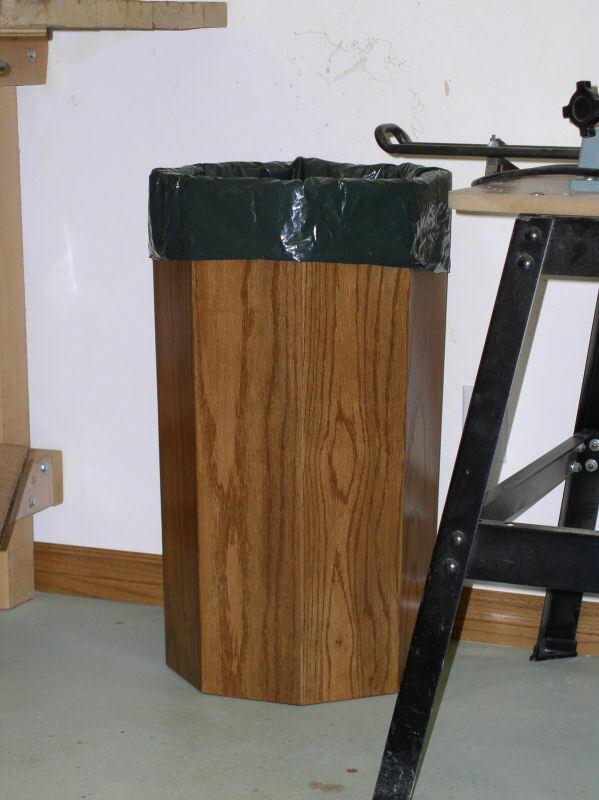 Here are some tips how I arrived at the measurements of this garbage bin, so that you can do your own calculations in case you like to build a garbage bin suitable for a different size garbage bag. Width of 26" means a circumference of 52", and hence 8 boards of 6-1/2" wide. Overall width of the garbage bin is about 16", so we need about 10" of the length to closed the garbage bag and tie it when the bag is full. Hence 26" inside height, adding a few inches for the bottom gives a total hight of 28". See Construction for details how to calculate the size of the bottom insert. Tapering the side boards 1/4" towards the bottom on both sides ensure that garbage bags can be lifted out of the garbage bin easily. A 1" by 4" slot as handhold is pretty much standard. 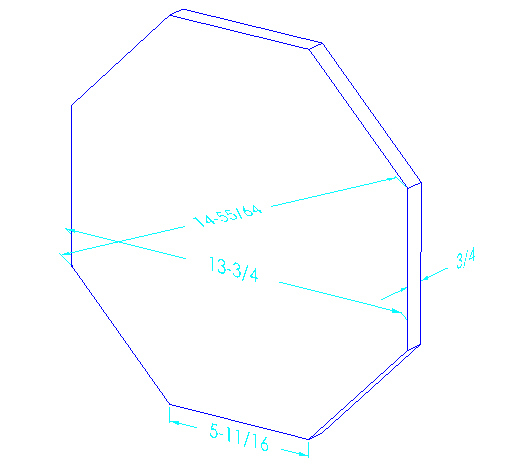 Click on a drawing to view the letter-size (8½" x 11") drawing in "pdf" format. Requires the free Abode Reader© 7.0, which can also be used for printing the drawing. Power tools -- table saw, miter saw, jointer, biscuit jointer, router, random orbit sander. Hand tools -- sanding block, tape measure, square, clamps/straps. All measurements are in inches (1 inches = 2.54 cm) because all wood measurements in the shop are in inches. I recommend to cut, shape and sand all pieces and dry-fit them together with straps. NOTE: In this description it is assumed that the jointer takes of 1/32" with each pass. The two boards should theoretically be 3/4" thick, but check it anyway. 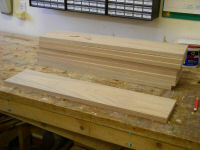 If not then now is the time to give them a pass through a thickness planer. 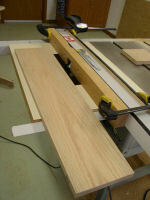 Take the 12 feet board and cut off a length of about 30" to make the bottom insert. There should be about 114" left. Cut the 30" piece in two equal lengths. Run one edge of each piece over the jointer to make the edge square to the surface. Use a biscuit jointer to cut slots for two #20 biscuits, 10" apart on center, glue the two pieces together, clamp, and put aside for later. Rip the two remaining boards to a width of 6-9/16". We will make it 6-1/2" later. Cut 8 lengths of 28". Safe the left over scrap piece as that is handy as test piece for dado and router bit setups. 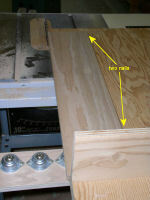 Stack you dado cutter for 3/4" width and mount in the table saw. Cut a 3/8" deep groove on the bottom end of each of the eight side boards at 1-1/4" from the end. 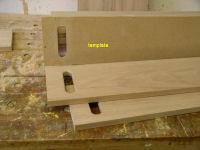 Make sure that the bottom insert fits loosely in the groove. Select two side boards and make the 1" by 4" wide handhold slot at 2" from the top of the two side boards. For that I used my router with a 5/16" straight cutter bit and a 7/16" template guide. Make the template such that you can line it up with the top and a side edge of a side board. The handhold opening in the template should be 1/16" larger on all sides compared to the required handhold size. Line up and clamp the template and side board together onto a work surface, and route out the handhold slot. Ease the edge of the handhold slot on both sides of the board using a 3/8" corner roundover bit. Next operation is to apply a 1/4" taper towards the bottom on each side of the side boards. For that you can use a taper jig, but being a cheap Dutchman I don't own one and used my own crosscutting board instead. 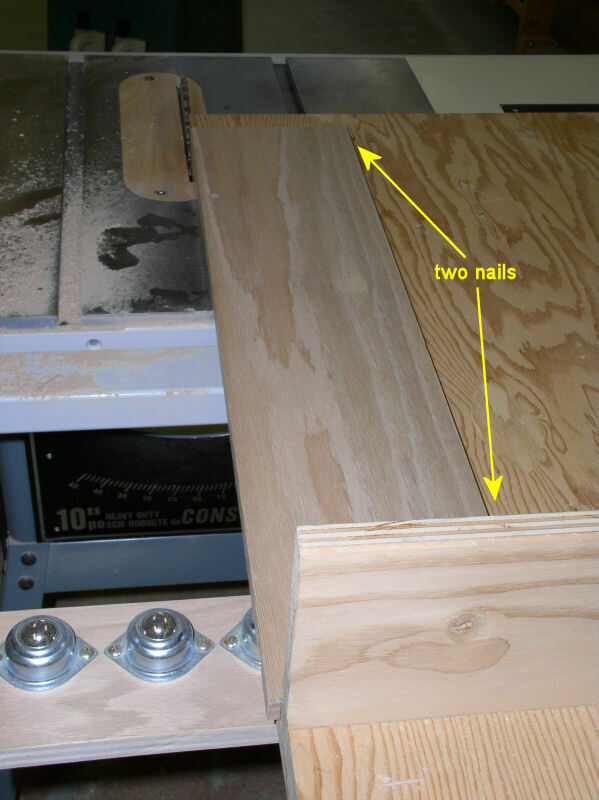 Place a side board on the crosscutting board with the to be tapered end towards you, and use two nails against the other edge of the board to keep it in place (see picture). Taper all boards on one side. Give the tapered edge one pass over the jointer. Then adjust the nails for the taper on the other side. Also pass this tapered edge once over the jointer. The top width should now be very close to 6-1/2". 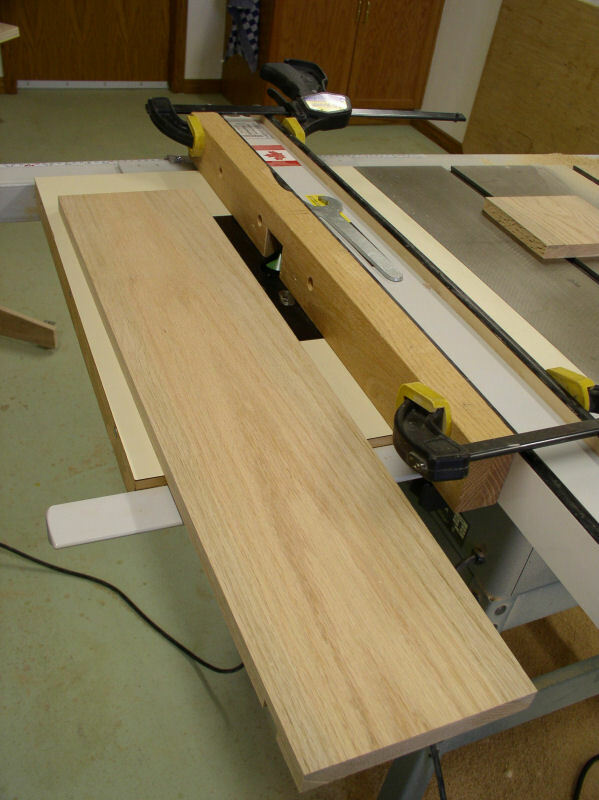 For cutting the V-groove the router must be mounted in a router table. 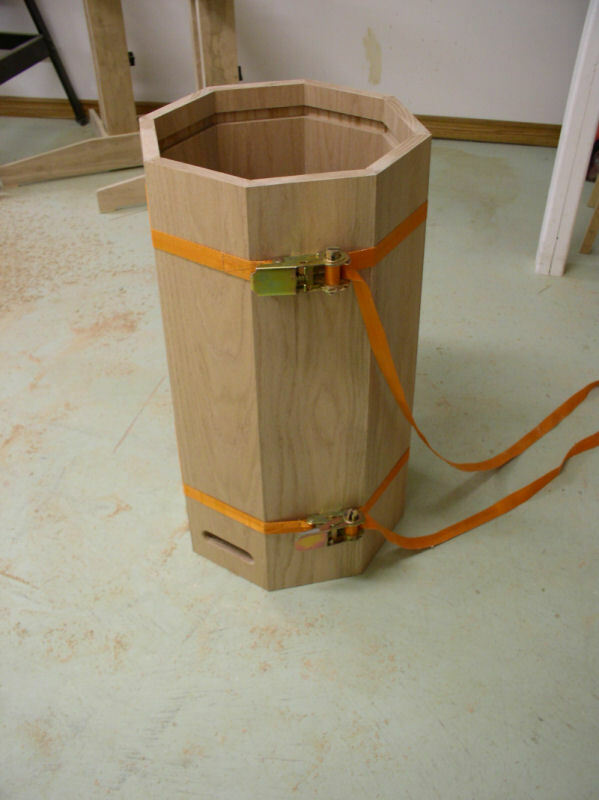 Put the 8-sided bird's mouth router bit in the router, and raise it to the approximate height. 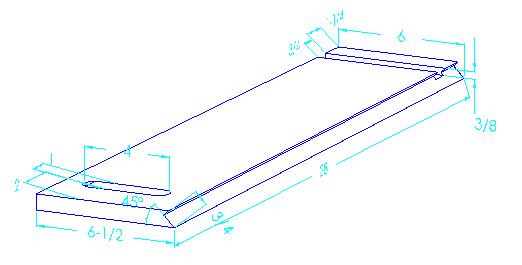 Lay a scrap piece (see point 3 above) flat and mark the top surface. On the crosscut side of the scrap piece draw a line at and angle of 45 degrees from the left top corner towards the bottom right. Mark a point along that line at 3/4" (or whatever the thickness of your boards are) from the left top corner. 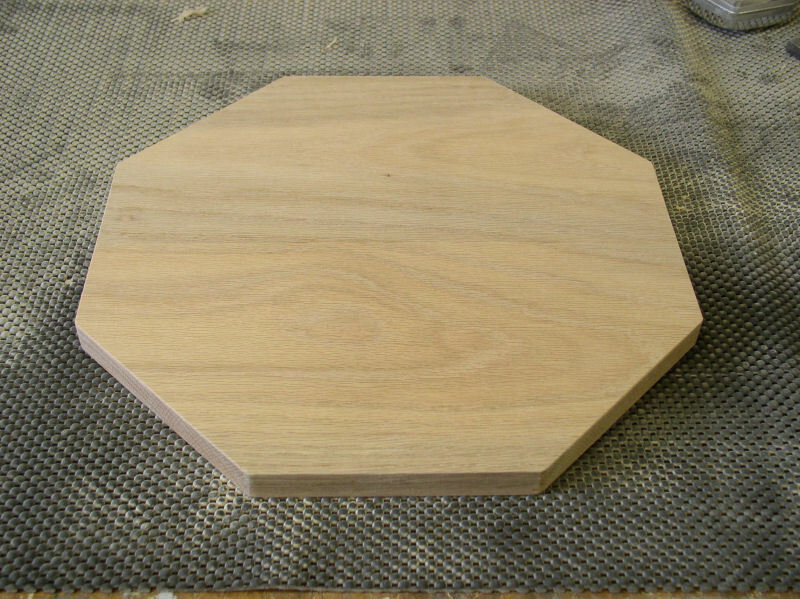 Place the scrap piece flat with top surface up on the router table and raise/lower the router bit such that the point of the router bit matches the point you have marked on the side of the scrap piece. Mount a "sacrificial" edge against your router table fence and adjust it such that you route about a quarter of the material out of the V-groove with each pass. 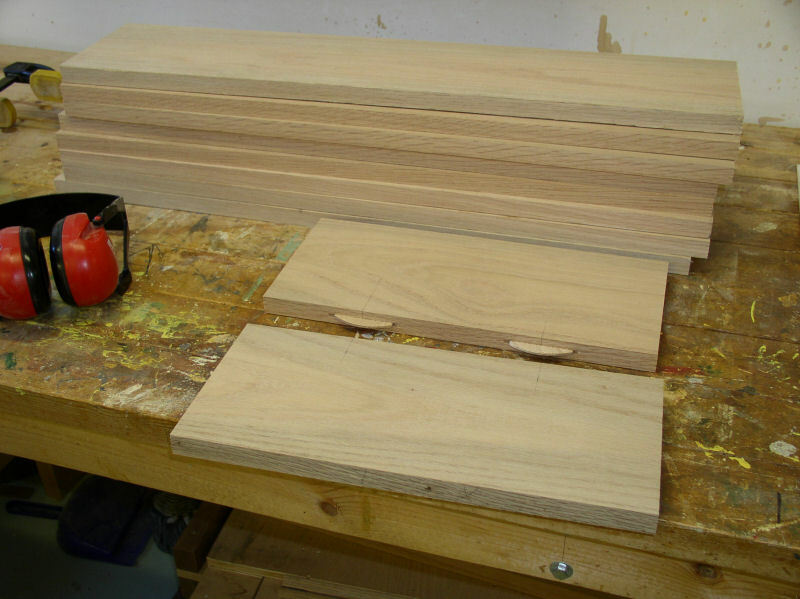 Place each side board on the router table, with the dado groove down and the tapered end to right, feeding the board from right to left against the fence. Be very careful at the last pass so that you don't take anything off from the top surface of the board. The best way is to ensure that you leave a very tiny edge (see V-groove detail picture). Now it is time to sand the surfaces of the side boards. Make also one pass with 220 grid sandpaper over the inside edge of the V-groove to take the rough edge away. Dry-fit the eight sides upside down on a flat surface, using masking tape to keep the boards together and then use straps. Measure also the four diagonals as these should be the same in length. 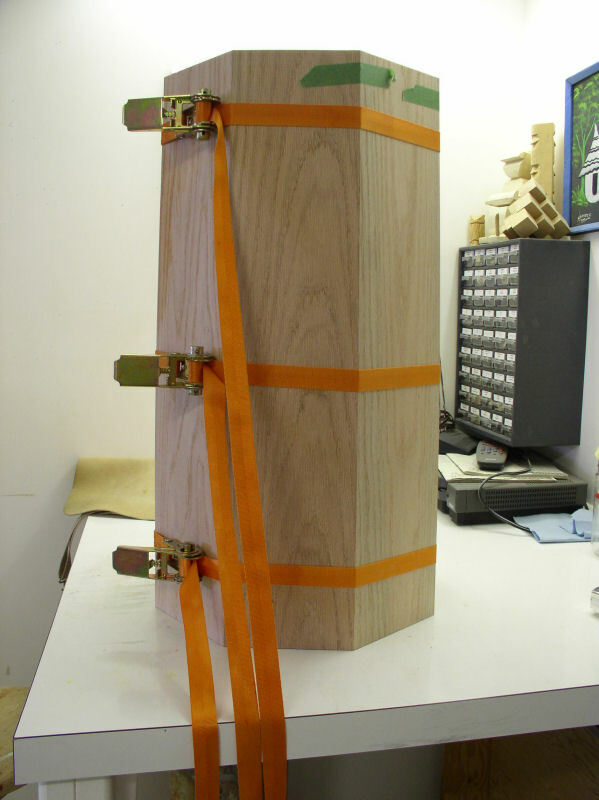 Make sure that the two boards with the handholds are opposite each other. Number the boards 1 to 8 counterclockwise (clockwise is fine too), starting with a board with a handhold. Most of the time I work alone and cannot glue up too much in one go. So for this project I glued one joint at a time. Apply glue to joint 1-2, put them back with the other boards, apply the three straps and tighten. Measure the diagonals to ensure that they are all of the same length, and if not then use a clamp to make them the same. Clean up any squeezed out glue with warm water. Let the glue dry. I typically use 2 to 3 times the recommended clamping time of the glue. Next glue the joints 5-6, 2-3, 6-7, 3-4, and 7-8. By now you should have two equal halves, which is essential otherwise you won't be able to fit in the bottom insert. 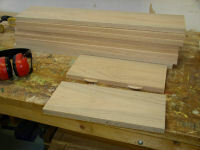 While the glue is drying in the above step, it is time to shape the bottom insert piece. Sand both surfaces of the bottom insert. 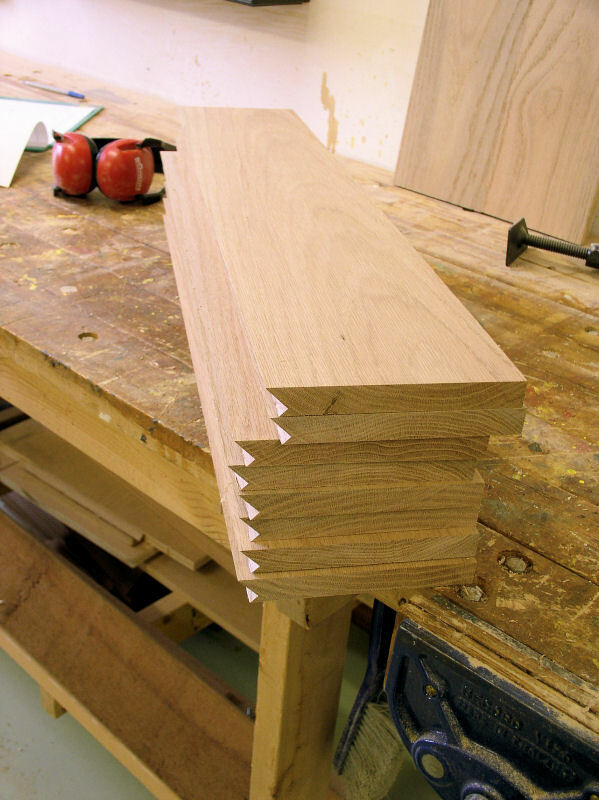 Run one edge over the jointer so that it is square with the surfaces. Take a measure from the bottom of the clamped side boards. That measure should be taken from the outside of one side to inside of the opposite side; rounding the measurement down to the nearest 1/16". My measurement was 13-25/32", so I round it down to 13-3/4". Rip the bottem insert to that width. Use a crosscutting board to cross cut the bottom insert to that same measurement, using the jointed edge against the fence of the crosscutting board. The resulting board should be a perfect square. Next take another measurement from the bottom of the clamped side boards. This time from the outside of a diagonal to the inside of the opposite corner. Multiple that measurement by 0.3825, and round it down to the nearest 1/16". 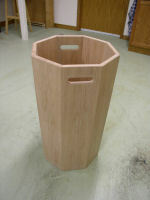 The result is the side length for each of the eight sides of the bottom insert. My measurement was 14-59/64", hence a side length of 5-11/16". Mark the exact centre on each side of the bottom insert, and mark the side length around that centre. Connect the end of one side length with the beginning of the other side length one the adjacent edge with a line. If everything is perfect then that line should have the side length. Basically creating triangles that the corners of the bottom insert board. These triangles can be cut off with the miter saw at 45 degrees. Ease over all edges. 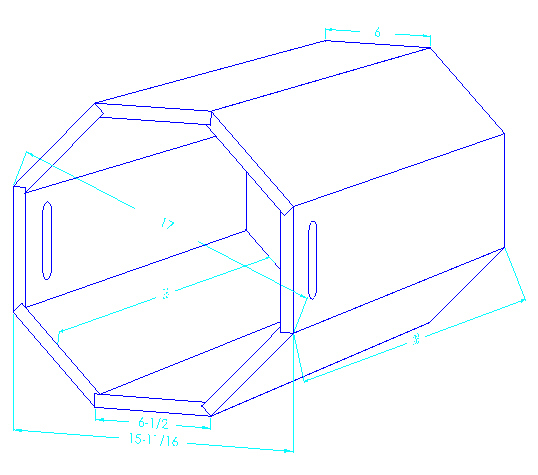 As soon as step 2 above is completed, try the fit of the bottom insert in between the the halves. Ideally the bottom insert should fit loosely. Apply glue to the joints 4-5 and 8-1, insert the bottom insert, put the two halves together, clamp with the three straps, and clean up the queezed out glue. Do final sanding of the glued edges. 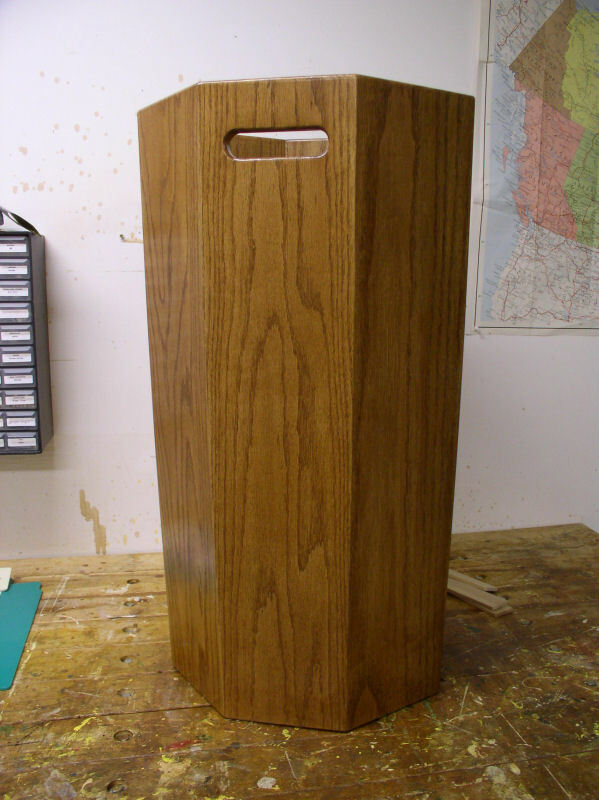 Round over the inside and outside edges of the top and bottom of the garbage bin, using the router table and a 3/8" corner roundover bit, and finishing the round over top and bottom with some 220 grip sandpaper. Stain and apply several coats of Acrylic Urethane Varnish. I apply up to 5 coats, letting each coat dry at least one day. I have not tried it, but I would say that you can cut the V-groove also with the table saw with the saw blade at 45 degrees. 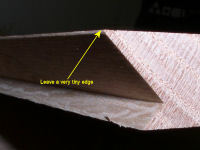 Cut the "short" edge of the V-groove first. 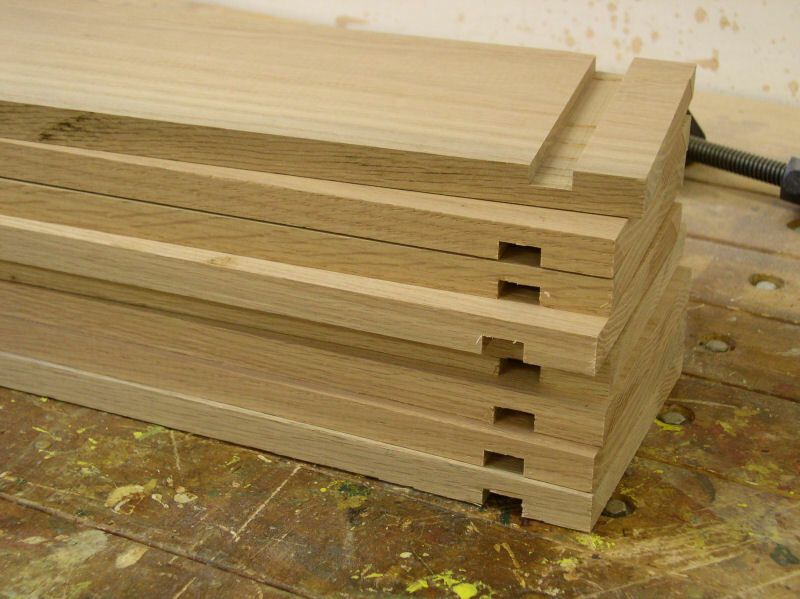 Due to the taper of the boards, some kind of jig might be required to do this safely. Updated: 5-Feb-2019 18:14 EST -- Copyright © 2003-2019 Pieter van Vliet. All rights reserved.